Real People. Real Experiences. Real Helpful. Did you know that Jessica Simpson can pick up things with her toes? Ryan Seacrest got her to show off her unique talent by picking up fruit from a bowl, using only her toes. Here’s the video. Plus more photos of Jessica Simpson’s feet. However you get them, foot blisters are a fact of life. Here’s how to treat (and ultimately prevent) blisters on your feet. All the best tips from athletes and home remedies. Whether you love Fergie’s feet or not, you have to admit that she has style. Regardless of whether she’s barefoot or wearing a pair of the stylish gladiator type shoes she seems to really love, she is definitely someone worth following. Charlize Theron Feet – She Thinks They’re Ugly, Do You? Charlize Theron feet aren’t ugly, if you ask me. But she thinks her feet are ugly. You decide. Whether you’re a fan of Eva Longoria feet or not, her feet are worth viewing. Here are some Eva Longoria feet photographs. Here are the best natural home remedies to treat your dry, cracked heels and feet. Some people’s feet sweat more than other people’s feet. Whenever your feet sweat, bacteria feed off the sweat and create smelly fatty acids that give your feet a really nasty odor. Combine this with the fact the fact that warm moisture encourages the growth of fungi, and you can have a real uncomfortable situation on your hands. Hayden Panettiere has gorgeous feet that have been captured in both film and photos — barefoot and in shoes. I’m quite sure we will be seeing more of Hayden Panettiere and her famous feet as time moves forward. 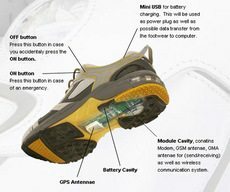 I predict that these GPS shoes are going to take our world by storm, and change the way we view keeping our loved ones safe forever. Here’s how they work, and where to get your own pair of GPS shoes. Get fun & helpful Foot Tips via email!